Another one of my passions is designing spaces and making a home feel cosy. Here are some examples of my design work. Our house was completely transformed from rented accommodation, with a floor plan made up of several rooms, into a flowing space with a homely feeling for a family of four. The living area has been unified while keeping the different areas of kitchen, dining and living somehow separate. A new large cantilevered window provides cosy space for reading, playing and wildlife watching. Wood was chosen as one of the main materials for floors and walls with red as an accent colour. This room started with a big yellow lion in need of a proper habitat, a piano to fit in and a request for lots of blue. To re-use as much furniture as possible, the old bed and IKEA chest of drawers were retained but painted. A new wooden wardrobe was purchased and customised to fit the colours of the room. To inject warmth into the room, one wall and the floor were cladded with wooden planks. A colorful wallpaper was chosen for the walls. The lion was very happy with the result! Here stone, wood and wool were used to create a warm atmosphere in the main bathroom. 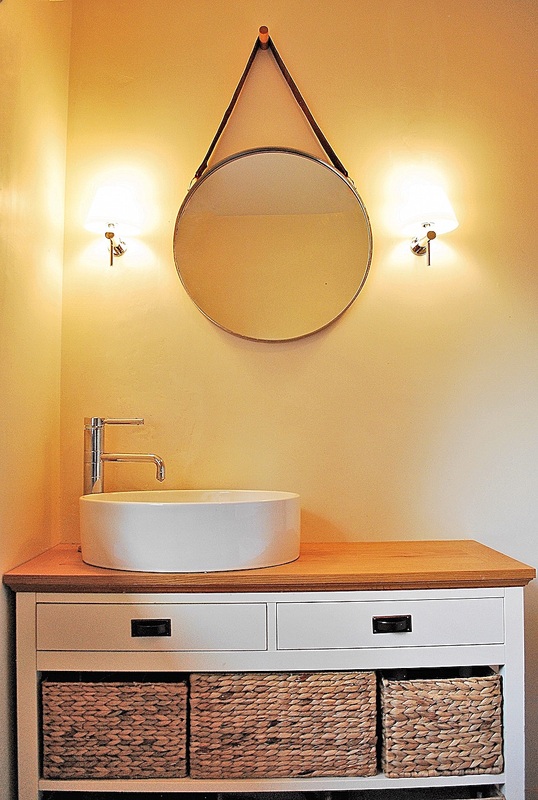 The free standing bath was positioned against a pebble wall. A console was bought as a base for the basin and rattan baskets were used to store towels and accessories and to hide piping. The floor is engineered laquered wood resistant to water. This is part of a 1970 development in the middle of the Karst landscape where each house is a wing of a whirlwind. So lots of angled walls to deal with!